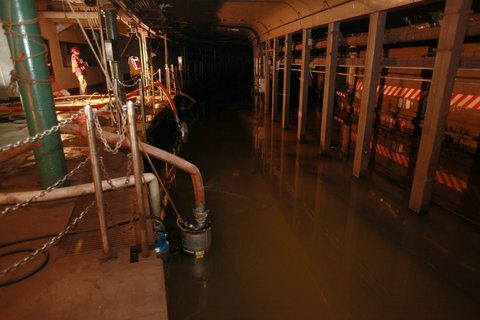 Workers pumping out water from subway tracks inside the South Ferry subway station, which was swamped by Hurricane Sandy. Transit officials said the old South Ferry station will be reopened while repairs are completed. Over its nearly 109 years, the New York subway system has inspired many questions. Why do pigeons ride the A train in Queens? What becomes of a failed MetroCard swipe, curdling at the turnstiles? Here is one nobody has ever had to tackle: How do you resurrect a subway station, left for dead beneath Lower Manhattan for nearly four years? With the South Ferry station, ravaged by Hurricane Sandy, still perhaps years away from returning to service, the Metropolitan Transportation Authority is reopening a shuttered station at the same location beginning next month, Gov. Andrew M. Cuomo announced on Friday. The change will restore the last stop on the No. 1 train, a critical link for Staten Island Ferry riders, and patch one of the few gaping service disruptions that has lingered since the late-October storm. But the move has also presented the authority with what appears to be a first-in-a-century challenge. The authority said a decommissioned station had never been reopened in its history. As recently as January, officials said, the prospect still seemed remote. The station is not merely old — it opened in 1905 — but antiquated even by mid-20th century standards. While many stations were enlarged in the 1940s and 1950s to accommodate 10-car trains, the length and configuration of the South Ferry platform prevented any change, allowing only passengers in the first five cars to exit. The quirk survived until 2009, when a glossy new station replaced the old one at a cost of over $500 million. The authority has estimated the new station will cost $600 million to rebuild. Though the agency has occasionally used the old station’s loop track for work trains — and as a turnaround point for No. 1 trains since the storm — the station itself has been almost entirely ignored. As officials considered a restoration, among the chief obstacles was refurbishing gap fillers between the platform and the tracks, which had been secured since the station closed to keep them from accidentally moving. “That was the real test,” said Joseph Leader, the subway’s chief maintenance officer. As workers removed the pin holding pieces of the moving platform in place and began lubricating the machinery, Mr. Leader said, the fillers creaked back to life with little incident. And so the platform area, it seemed, could be renovated in due time. But how would people get to it? The old station had only one entrance, accessible from within the Whitehall Ferry Terminal. Mr. Bianco said the authority coordinated with the Transportation Department, which operates the terminal, to reopen that entrance. It also plans to forge another entrance by knocking down two walls from the mezzanine of the storm-soaked station and connecting it with the older one. The authority said this work would allow riders to transfer, as they could before, between the No. 1 train and the R train at Whitehall Street station. Then there are the technological considerations. Because the platform’s curvature prevents conductors from seeing all cars at once, the authority is installing a closed-circuit television system, with monitors over the platform, to give crews a fuller view of their trains. Other work includes building stairs through a new entryway, installing lights for both the station and the tunnel, and putting the final polishes on a station that no one expected to beautify again. One concern, he added, is that many of the authority’s crews either do not remember or were never taught how to navigate the old station’s eccentricities. “Not all of them are the old-timers,” he said. The five-car rule, he noted, will be returning with the station. But for Mr. Leader, the old station’s opening may be particularly resonant. On the night of the storm, armed with a flashlight to inspect a flooding South Ferry, he was forced to flee the new station as waters surged over the platform and began moving up the stairs. With that hub in ruins since October, he suggested on Friday, perhaps riders needed to be reminded of the simple joy of a functioning station. A version of this article appears in print on 03/09/2013, on page A14 of the NewYork edition with the headline: Storm Damage Prompts Return Of Subway Stop.